When I decided to teach a plum upside down cake in a recent class, I didn’t think I would write a blog post about it. There are loads of recipes for plum upside down cakes on line. 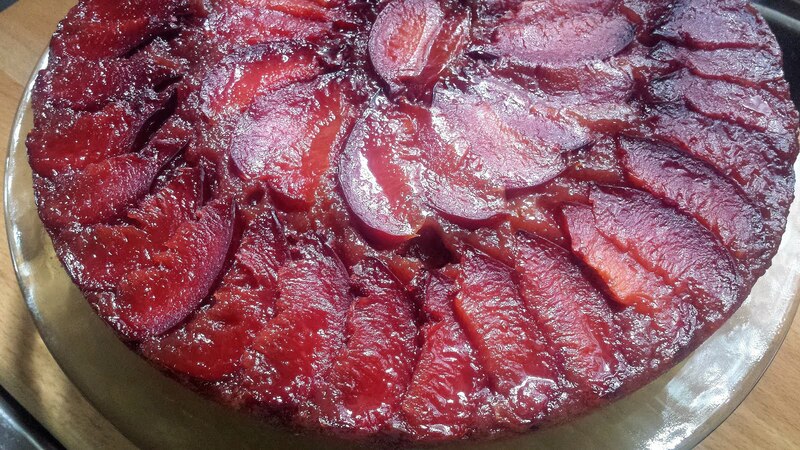 Beyond that, I had already posted a recipe for individual plum upside down cakes a few years ago. There just didn’t seem to be much to add to the conversation. 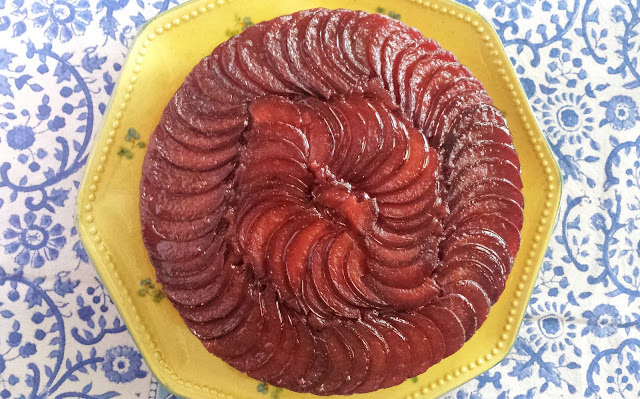 But when I started testing recipes, I discovered that the way I think one should put plums on top of an upside down cake is entirely different from what everyone else seems to be doing. 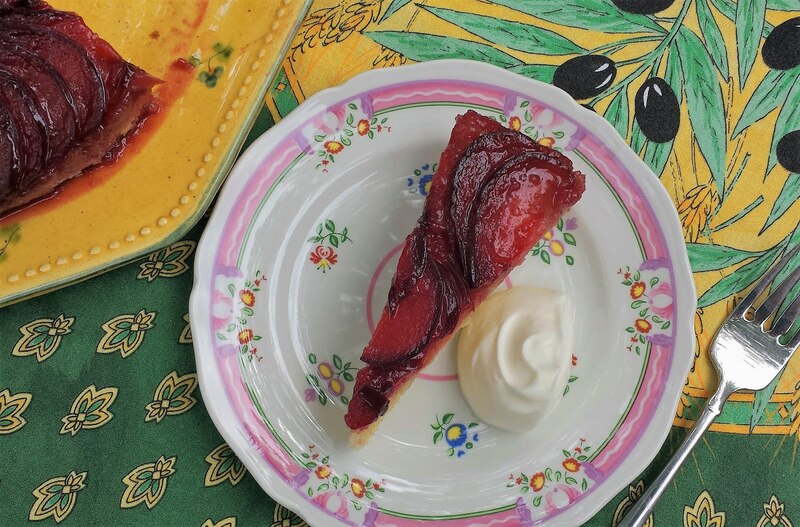 If you look at my recipe for individual plum upside down cakes, you will notice that the top is covered with thin, shingled slices of plums. 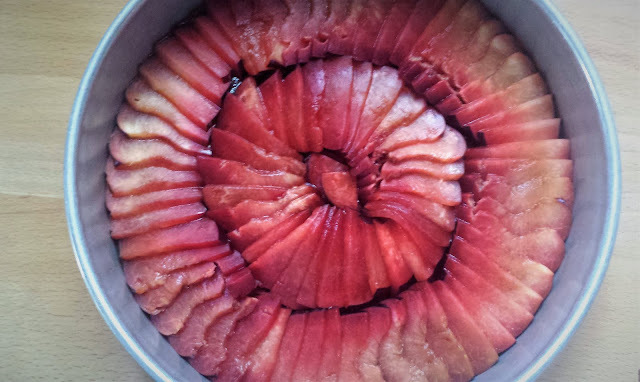 The fanned look of the arcs of the dark skins of the plums is gorgeous. For this reason alone I expected that this was the way most people would do it on a large cake as well. 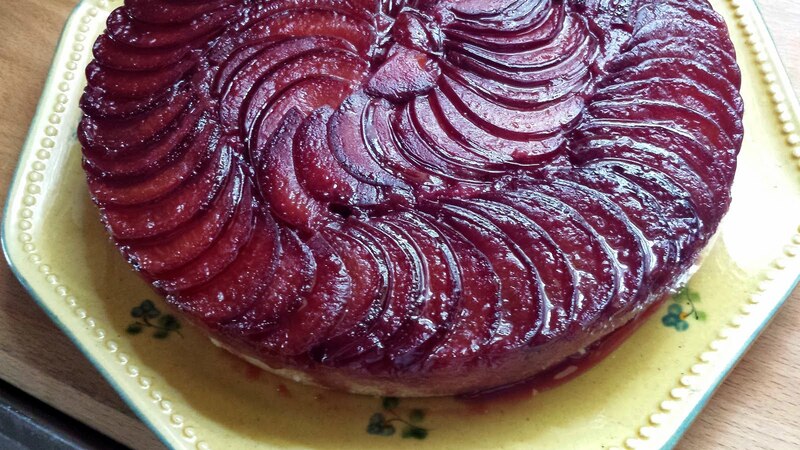 Instead, I found that most recipes simply direct you to cut the plum into wedges…and to lay them in the pan in concentric circles…sometimes directing you to overlap the wedges slightly…sometimes not. 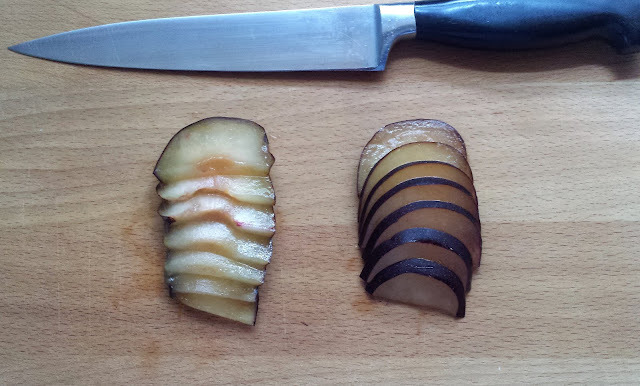 The second time, I tried wedges again and just arranged them in slightly overlapping circles in the most natural manner—with the fat edge/skin side of the wedge resting on top of the inner edge of the previous plum. This of course looks beautiful in the pan but is not especially beautiful on the reverse side—which is of course what you see when the cake is flipped. It is not unattractive… And it doesn’t fall apart when flipped… But I think there is a better way. 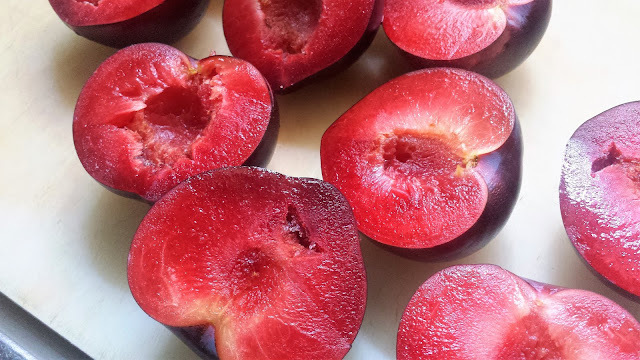 So in my third and last run at the recipe, I did what I thought I should have done from the start: cut the plums into thin, half circle slices. These can be successfully shingled so that the beautiful arcs of the skin are visible when the cake is flipped. Furthermore, since the slices are thin, you can lay them in quite snuggly, which in the end, not only creates a lovely fanned plum effect, it results in a solid layer of cooked plum on top—rather than discrete wedges of plum surrounded by cake. Laying the slices of plum in this way is not intuitive if you have difficulty visualizing things spatially…and in reverse. If this is you, then work it out with a real plum on your cutting board. Lay a plum half cut side down and slice it thinly. Then, fan it on the counter the way you want it to look on the cake (on the right, in the picture above). Slide a spatula underneath the fanned plum and gently flip it over (on the left, in the picture). The way it looks when flipped is how it should be placed in the pan. Basically you will be placing each successive slice with the inner edge (where the pit was) on top of the outer edge (the skin side) of the previous slice. It will not look nearly as attractive as the concentric circles of wedges in the pan—but when the cake is finished…and served upside down…it will be spectacular. Preheat the oven to 350°. Butter the sides of a 9-inch round cake pan with 2-inch high sides. Melt the butter and brown sugar in a sauté pan/iron skillet set over medium-low heat. When the sugar has dissolved, increase the heat and simmer, stirring constantly, until the mixture comes together in a thick, smooth sauce. Scrape the mixture into the prepared pan. Tilt the pan and spread as necessary so that the bottom of the pan is covered with the sugar mixture. Arrange the plums in overlapping concentric circles on top of the butter/sugar mixture (see note). Set aside. Whisk together the cake flour, baking powder, baking soda, and salt. Set aside. Cream the butter with the sugar until light and fluffy—this will take 3 to 5 minutes at medium-high speed using the paddle attachment. Stop the mixer once or twice to scrape down the sides. Whisk together the egg, yolk and vanilla. Add this mixture in two or three additions, beating after each addition and scraping down the sides of the bowl as necessary. When all of the egg has been added, beat briefly to restore the creamed mixture to fluffiness. Fold in the dry ingredients in 2 additions alternately with the sour cream, beginning and ending with the dry ingredients. 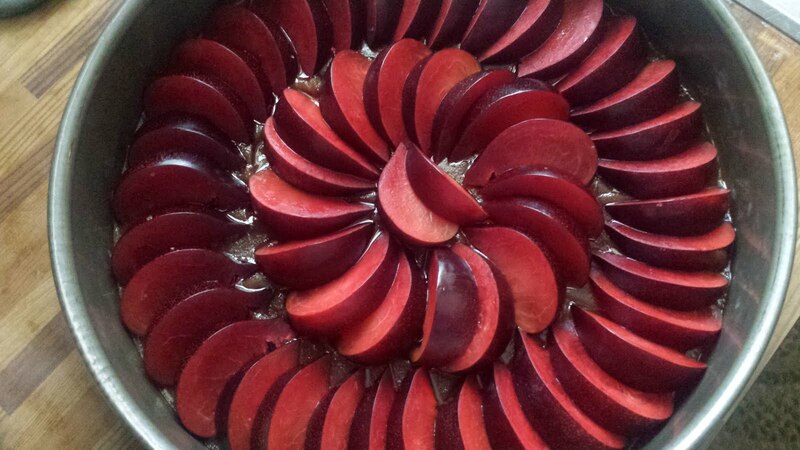 Spread the batter evenly over the plums in the prepared pan. 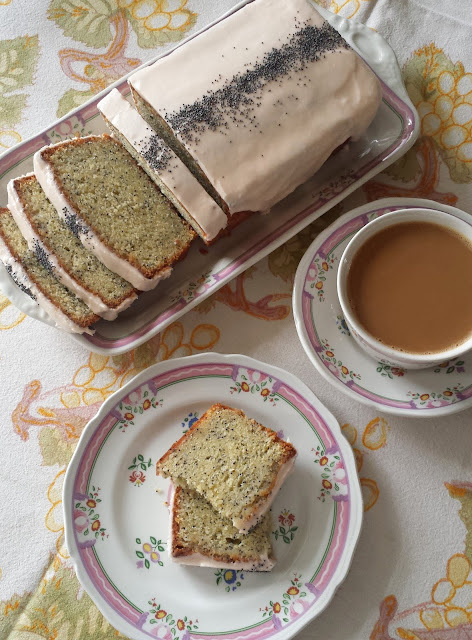 Bake in a 350° oven until the cake is springy to the touch, has begun to pull away from the sides of the pan and a toothpick inserted in the center comes out clean—about 40 to 50 minutes. Let the cake rest for 25 to 30 minutes in the pan. Run a knife around the inside edge of the pan. Place a cake plate upside down on top of the skillet and holding the cake plate firmly to the skillet, quickly flip the cake over. Leave the pan over the cake for a minute or two and then carefully lift up and away. Allow the cake to cool for a couple of hours before serving. 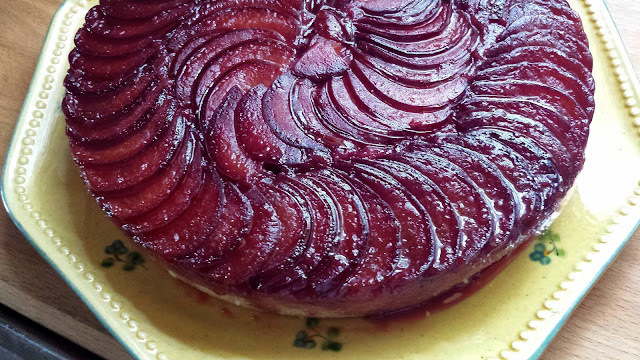 Use a thin sharp knife, with a gentle back and forth sawing motion to cut through the plums and down into the cake. Serve the cake warm with whipped cream or ice cream. Serves 10. Note: When building the fruit portion of an upside down cake you have to remember that you are working in reverse. To get the look you want, you may need to shingle a few slices of the fruit on your cutting board and then use a wide spatula to flip it over so you can see how it will look on the finished cake. For plums my experience is that the top looks best if the outer curve, or the skin side, of the plum (not the pit side) is what is visible. So, when laying in the plums, lay down the first slice and then lay the next slice with the “pit side” of the plum shingled over the “skin side” of the first one…and then repeat this pattern for each successive slice, creating a spiral effect with the skins on the side you can’t see now…but which will be visible when the cake is turned out.